Notice and agenda filed in the office of the City Clerk and posted at City Hall at 4:30 p.m. on Friday, October 14, 2011. A. Approval of October # 1 Payroll in the amount of $39,652.37. B. Approval of Claims in the amount of $34,667.39. C. Approval of Minutes from October 3, 2011 Regular Meeting. Richard or JoAnn Gast, 2 spaces; Joe Alan Dunsworth, 2 spaces. E. Approval to close Main Street from 9th to 14th Streets from 10:30 a.m. to 12:00 p.m. November 11, 2011 for the Annual Veterans Day Parade. F. Approval to close Main Street from 9th to 12th Streets from 5:00 p.m. to 6:30 p.m. October 31, 2011 for the Annual Halloween Parade. * Planning now for "Just Treats"
8. Discussion and possible action regarding request from Ed and Billie Lincoln to plant a tree on their cemetery lots in Ridgelawn Cemetery. -- Tabled, pending a more comprehensive plan for cemetery landscaping as trees and certainshrubs near gravesites can present maintenance issues and difficulties digging new graves. The commissioners did request that this family be consulted with (by city staff) to determine if some interiumsolution could be agreed upon. Public Works irector Phil Stowell had suggested a site on the perimeter of the cemetery be designated for memorial trees. Several commissioners commented that the cemetery "looked bare" compared to pre-2007 ice storm views. 9. Discussion and possible action to remove building at 215 S. 11th Street. -- Approved, removal of the old unmaintained (city-owned) building just south of the police station. The building had formerly been a doctors office. 10. Discussion and possible action on Senior Citizens Building located at 910 W. Center -- Tabled after discussion. The building on the south portion of the fair grounds was damaged by an August 2011 attic fire. Appears the commission would rather tear down the damaged structure rather than try to repair. 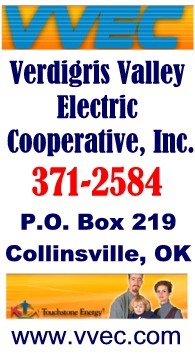 Potential ownership issues between the city and the Collinsville Tri-County Fair Board need to be worked out before a final decision can be made. Appears the structure was deeded to the city with a stipulation that it revert back to the fairboard if not continued to be used for public benefit. (more of discussion at 10/13/2011 work session). A. Approval of October # 1 Payroll in the amount of $27,079.77. B. Approval of Claims in the amount of $310,193.73. 5. Discussion and possible action to declare scrap wire surplus. -- Approved, increasing security after a recent break-in at city yard, but no need to keep this pile of scrap wire that can be sold to benefit the city. * Will be determining slope of residential connection to new lanes on Main soon. * Building permit issues for new structure near car wash on East Main. * American Bus Sales has been in operation for about 2 months now in the industrial park (with 30+ employees).